Eczema is considered an immune deficiency and requires a cure to work both inside and out. Aloe Vera is one of the few natural wonders that has been shown to reduce eczema symptoms both on the skin and in the immune system. 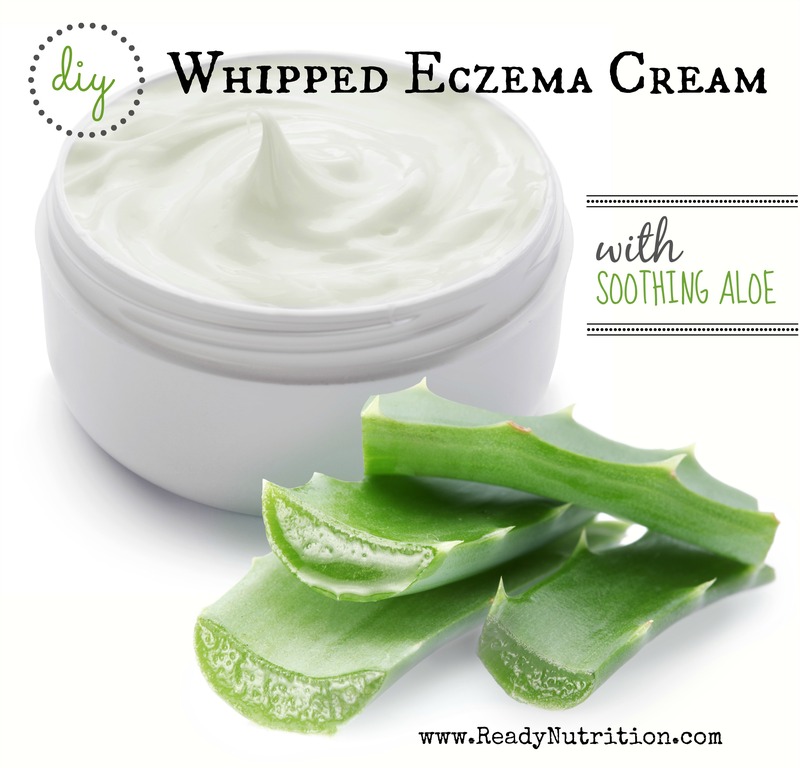 This whipped lotion recipe uses soothing aloe vera, jojoba, as well as many other skin healing agents to create a rich cream that will help soothe eczema flare-ups and help the skin regenerate. I was talking with my sister the other day and she mentioned that her toddler started getting small patches of eczema on her arm. Now, what kind of auntie would I be if I didn’t whip up a batch of soothing eczema cream for my sweet baby niece? Eczema is considered an immune deficiency and requires a cure to work both inside and out. Aloe Vera is one of the few natural wonders that has been shown to reduce eczema symptoms both on the skin and in the immune system. In fact, according to MedlinePlus, a service of the National Library of Medicine and the National Institutes of Health, notes, “Some chemicals in aloe gel seem to be able to increase circulation in the tiny blood vessels in the skin, as well as kill bacteria. Together, these effects suggest that aloe gel might be effective in accelerating the wound healing process.” Although it is too early to come to a final conclusion, many reputable studies indicate that aloe does in fact strengthens the immune system, as well as assisting in healing epithelial tissues. Shea butter – This natural butter is a superfood for the skin and instantly helps with dry skin, eczema, and skin problems. As well, the deep moisturizing assists in skin regeneration, and possesses skin healing properties. Jojoba oil – Jojoba oil’s similarity to sebum allows it to absorb easily and readily into your skin, making it a gentle, skin-softening moisturizer for all skin types. Calendula oil – This healing oil has traditionally been used to treat an assortment of ailments including: conjunctivitis, blepharitis, eczema, gastritis, minor burns including sunburns, warts, and minor injuries such as sprains and wounds. Aloe vera – Using aloe vera for eczema is considered to be an effective and natural way to relieve dry and itchy symptoms and help the skin regenerate. Vitamin E – Vitamin E oil promotes healing and is an active ingredient in many products available for skin and nails. In a large bowl, add all ingredients and blend together using an electric blender. Using a large spoon, add eczema cream to clean containers. Use as needed to relieve symptoms associated with eczema. To assist in relieving skin irritation, refrigerate cream to keep cool. The end result is a rich cream that absorbs perfectly into the skin. Best of all, it smells wonderful! I will keep you all updated on how well the eczema cream works on my niece. In the meantime, whip this easy recipe up and enjoy the healing benefits of aloe! My stepson has suffered from it all his life. The itching apparently gets so bad for him that he can scratch himself bloody without knowing it! We’re ordering the parts we don’t have this payday! I used aloe gel in mine. Hi just wanted to ask did you use unrefined Shea butter and if yes did you just put the chunks in the blender ? are you using some kind of processed aloe, or direct from the plant leaves? and what about the calendula oil? is this an essential oil, or have calendula petals been soaked in a neutral veg oil for some time and then filtered?